But for years before it was Zimbabwe, it bore the name of a British colonial businessman, Cecil Rhodes, who obtained a charter for the land in 1889 as part of his grand ambition of building a railroad and an empire from Cape Town, South Africa, to Cairo, Egypt. White settlers moved into Rhodesia, defeating the Ndebele tribe who had settled in the area decades earlier after fleeing Zulu violence and Boer migration in what is present-day South Africa. In 1923, Rhodesia became a self-governing British colony with the whites in power. Over the next several decades, laws were passed guaranteeing rights to whites while working conditions and wages for blacks declined. In the 1960s, two black political parties emerged, the Zimbabwean African National Union (Zanu) and the Zimbabwe African People's Union (Zapu), but both were officially banned and their leaders imprisoned. In 1965, Prime Minister Ian Smith unilaterally declared Rhodesia independent under white minority rule. The United Kingdom saw the move as an act of rebellion, and in 1968, the United Nations voted to impose economic sanctions on the country. In 1970, Smith declared Rhodesia a republic, but the international community refused to support the dramatically segregated social structure, which has been compared with South African apartheid. While Smith governed, guerrilla armies fought back, eventually forcing the white government to allow elections. The 1979 constitution provided for democratic majority rule. In 1980, Zimbabwe became an independent nation governed by a coalition of Robert Mugabe's Zanu Party and Joshua Nkomo's Zapu Party. But fighting flared up between the two groups, and Mugabe, the new prime minister, ordered a crackdown in the southern Ndebele-speaking region of the country, where support was strong for Zapu. By 1988, peace talks led to a reunification of the two groups and the formation of Zanu PF, a merger between Mugabe's party and Zapu. Mugabe has won every election since 1980, but most have not been considered “free and fair,” with critics alleging that voters have been intimidated and opposition members harassed. Although some say Mugabe's reign is coming to an end, Zanu PF's most formidable opposition, the Movement for Democratic Change (MDC), recently suffered a crippling split. In 2005, MDC leader Morgan Tsvangirai decided to boycott elections for a newly created senate, causing many members of the party to break off into a separate faction, the MDC UK. When Zimbabwe became independent in 1980, average annual growth rates were as high as 4.5 percent. During the 1990s, however, the economy hit a plateau, and by the end of the decade, it was on a steady decline. Agriculture was once the backbone of the Zimbabwean economy, with cotton and tobacco the principal cash crops and corn the chief food source. Owing both to government seizures of white-owned farms and to drought over the past few years, supermarket shelves are empty and maize is hard to come by. Zimbabwe still exports some tobacco, but neighboring Zambia has taken over many of Zimbabwe's former markets. Hyperinflation is devaluing the Zimbabwe dollar, and unemployment may be as high as 80 percent. Living standards are at their lowest levels in 25 years of independence. A recent article in Prospect magazine said a bowl of pasta now costs half a million Zimbabwean dollars. 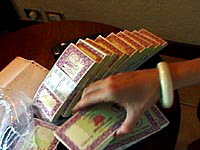 Out-of-control inflation means that piles and piles of bills are necessary to purchase even the cheapest commodities. Trying to keep up, the government recently printed a bill worth ZW$100,000. The dire economic conditions are driving thousands of Zimbabweans every week across the borders into neighboring countries to purchase food or to find work as illegal migrants to support their families. The government controls almost all of the newspapers and radio and television stations in Zimbabwe. Furthermore, restrictive media laws prohibit publication of “inaccurate” information. A media law passed in 2002 requires journalists to officially register with the government-controlled Media and Information Commission. If they attempt to publish without a license, they risk imprisonment. Dozens of reporters and editors - some who have received international accolades for their coverage - are routinely arrested for defaming Mugabe. The Committee to Protect Journalists (CPJ), a U.S.-based organization that promotes freedom of the press, has named Zimbabwe as one of the worst places in the world to be a journalist. In 2004, Zimbabwe placed third on the list, behind Iraq and Cuba. 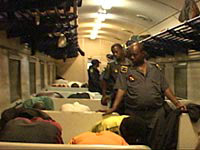 According to a 2005 report from the CPJ, at least 90 Zimbabwean journalists, including many of the nation's most prominent reporters, now live in exile in South Africa, other African nations, the United Kingdom and the United States, making it one of the largest groups of exiled journalists in the world. Today Zimbabwe has no independent daily newspapers, no private radio news coverage and just two prominent independent weeklies - the Zimbabwe Independent and The Standard. ZIMBABWE: A MODEL FOR AFRICA? Zimbabwe was once one of the more stable nations in southern Africa. The country had a reputation for being the breadbasket of the region, and its agricultural exports seemed to ensure enduring economic prosperity. Now the agricultural economy has collapsed, and the country's population suffers from malnutrition. Zimbabwe's basic infrastructure is also falling apart. For example, the nation used to have one of the best telephone systems in Africa. Now it is almost impossible to get a new phone line connected. 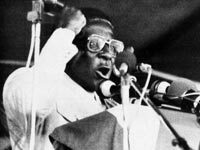 When Robert Mugabe first took office in 1980, he funneled resources into building up education and health care, providing services that had been denied to many Africans under Ian Smith's white-minority regime. But now schools and hospitals are badly neglected. The once-prestigious University of Zimbabwe is finding it almost impossible to continue functioning. In a country where teachers were relatively well-paid and literacy rates were once above 90 percent, school attendance has plummeted, teachers can barely subsist on their salaries and families are in such bad shape that they send their children out to work instead of to the classroom. Some reports estimate that at least 10,000 teachers have left Zimbabwe in hopes of finding better employment in South Africa or Britain. 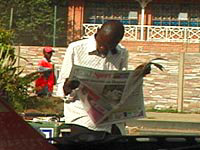 The ZW News site provides a daily summary of Zimbabwe news from newspapers around the world. You can read articles on the Web site or subscribe to a daily newsletter. A civic action organization, Sokwanele has as its goal “removing the dictator through nonviolent action.” The organization’s site features a blog; essays on the main political parties and their leaders; articles about human rights, the economy, the environment and politics; a collection of links; and an image gallery. SW Radio is an independent radio station presenting news and current affairs programs for broadcast in Zimbabwe from a studio in London. Beamed to Zimbabwe on shortwave and mediumwave to circumvent Zimbabwe’s restrictive media laws, SW Radio’s broadcasts are routinely jammed by the government. Southern Africa’s leading weekly business and political newspaper is owned by Zimbabwean investors. View satellite images of the effect of the Zimbabwean government’s controversial Operation Murambatsvina, which left 700,000 people homeless last year. This June 2006 article from the San Francisco Chronicle, describes Zimbabwe as a “pirate ship” that is sinking. The story outlines Zimbabwe’s rapid economic decline, the disastrous effects of a land redistribution program, as well as other problems that have beset the country in recent years, including drought and chronic food and fuel shortages. In this archived story from The New Yorker online, journalist Philip Gourevitch reports on conditions inside Zimbabwe in an account from 2002, where he describes a leader, four years ago, clinging to power, and taking his country down with him. In the June 26, 2006, issue of the magazine, Joshua Hammer follows up that report. In “ Big Man: The Twilight of Mugabe,” Hammer describes Zimbabwe today, where every facet of daily life has been corroded. This in-depth BBC report covers the controversial issue of Zimbabwe’s land redistribution program, tracing the conflict back to its colonial roots, as well as many other issues the country faces. The official site of Zimbabwe’s government features pictures of the country’s leaders and links to the various ministries. Calling itself Zimbabwe’s “official opposition party,” the MDC, under the leadership of Morgan Tsvangirai, sprang out of the labor movement in 1999. The party’s Web site outlines its political platform. This breakaway faction is led by Arthur Mutambara. The party split over disagreement about Tsvangirai’s actions regarding elections for a newly formed senate. This independent trust works to promote responsible journalism in Zimbabwe through monitoring and analysis of news and current affairs. This is an electronic network of Zimbabwean NGOs and civil society organizations. The Web site archives more than 5,000 documents about Zimbabwean civil society. Zimbabwean-based NGO that works with the survivors of torture and organized violence. This coalition of more than 350 civil society organizations was formed as a collective response by Zimbabwean civilians to the crisis facing their nation. This organization is devoted to networks and partnerships between exiled Zimbabweans. This independent nonprofit organization works to prevent and resolve deadly conflict. The CPJ is a nonpartisan, nonprofit organization that monitors abuses against the press and promotes press freedom around the world. This is a magazine, resource guide and mail order catalog for people worldwide who love Zimbabwean music and culture. The Zimbabwean Music Festival is an annual celebration of Zimbabwean music and culture in the United States. The 2006 festival will be held in Veneta, Oregon, on July 21, 22 and 23. This Web site is a colorful virtual showcase and promotion of African artists. This nonprofit organization is devoted to Zimbabwe’s famous Shona mbira music. Visit this site to find out more about Zimbabwean poets and other artists. The United Nations established the Zimbabwe Relief and Recovery Unit in October 2001 in response to worsening food, security and humanitarian crises in Zimbabwe. ReliefWeb is a project of the U.N. Office for the Coordination of Humanitarian Affairs. This U.N. agency is responsible for fighting global hunger. View photographs of banknotes of Zimbabwe from 1994 to 2001. Sources: allAfrica.com; BBC News; Bulawayo1872.com; CIA World Factbook; Committee to Protect Journalists; International Herald Tribune; Integrated Regional Information Networks; Prospect magazine.